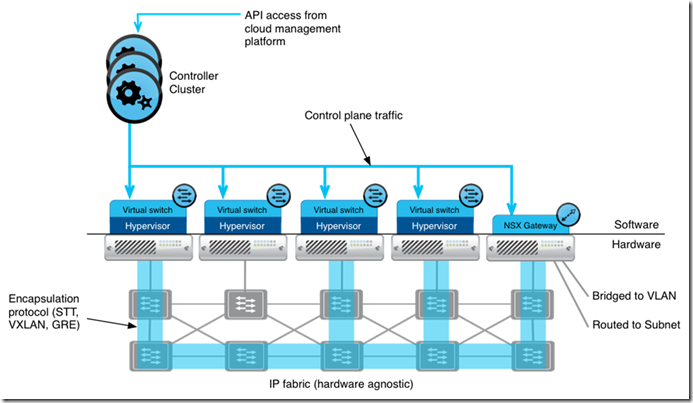 Determine how storage and network topologies affect capacity requirements for a vCloud conceptual design. Explain to the customer due to the constraint of having to use existing switches it is not possible to provide the required network bandwidth for each host so they will need to buy more hosts so that the virtual machines on each host get their required bandwidth. This way of thinking applies exactly the same for storage and if you are running converged networking then it can be almost exactly the same. Describe VMware vCloud Director and VMware vSphere functionality and limitations related to capacity. This in my opinion is all about vSphere and vCloud maximums which is always something you have to keep in mind when doing a conceptual design as for example the linked clone chain length limit is 30 and then after this a new shadow copy is created which then utilises more space on a new datastore and affects storage capacity. Actually knowing these functionality metrics and limitations is something I have been learning from going through the vCAT documentation. I did think about listing all of them but there are so many and what they could impact is so vast I think this is something where you need to know the limitations and functional capabilities of the two products and then think of it in the holistic manner of the whole design and how it impacts the conceptual design. Now remember the conceptual design is the “napkin” style design and so product names do not feature but you need to understand at a certain level what is and is not possible from the products. As I mentioned in my previous point if you feel I am totally wrong then please do tell me in a friendly manner as I am certainly not perfect and am doing this to learn. 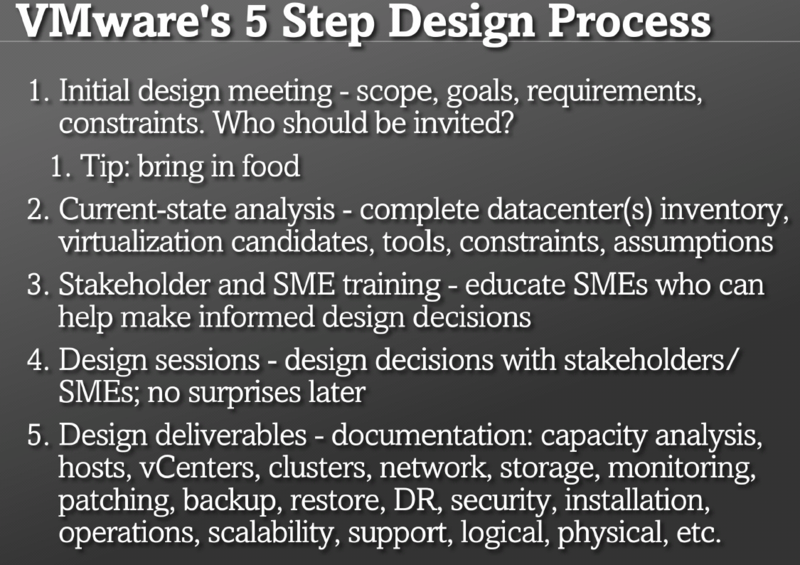 Given current and future customer capacity requirements, determine impact to the conceptual design. During your design workshops you will work out and record what the customer’s current and future capacity requirements are and then will need to plan for that 20% year on year growth they require to give an example. So if their current requirements can be met with eight hosts to be very simplistic then you will need to ensure you have sufficient capacity not just in compute but also storage, networking, cooling, power and switching. Given a customer datacenter topology, determine impact to the conceptual design. For this I think I covered it in the first section but you now need to look at the whole topology with storage, networking, power, rack space, distances between components, distances between datacentres, cooling and weight limitations to name a few off my head that may impact your conceptual design. So say for cooling you can only put in a certain amount of hardware into each rack which then impacts your conceptual design of how many blades can fit into the datacentre/server room. Given cloud capacity needs, constraints, and future growth potential, create an appropriate high-level topology. 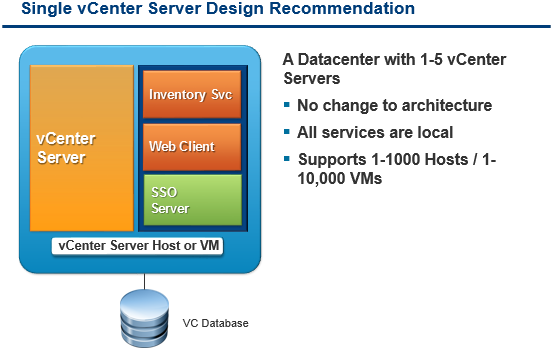 Categories: Certifications, VCAP, vCloud, Virtualisation, VMware | Tags: conceptual, design, vCloud Director | Permalink. We were all provided a portion (or slice?) 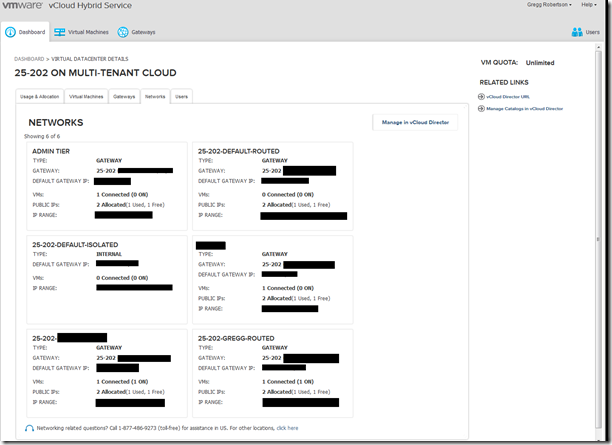 of a virtual datacenter in a multi-tenant cloud. As a bonus I got to share mine with two VCDX’s Chris McCain and Matt Vandenbeld. It’s always super exciting for a nerd like me to be able to do some of the cutting edge stuff with some of the top names in the industry. 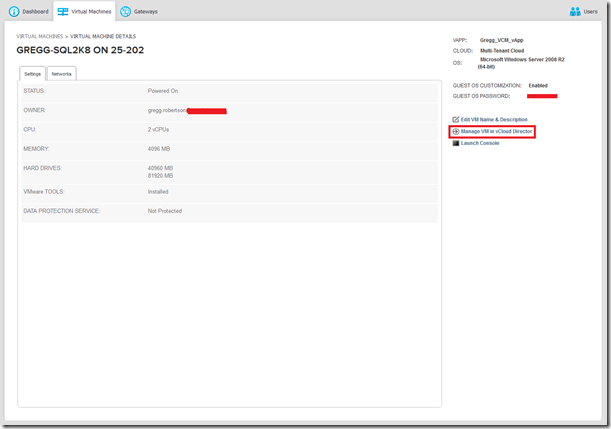 The custom portal for vCHS looks extremely sleek and very intuitive for anyone using it for the first time or who may not have even used the vCloud GUI extensively. The front page presents you with a good overview of all your resources bundled into a Resource Snapshot section. 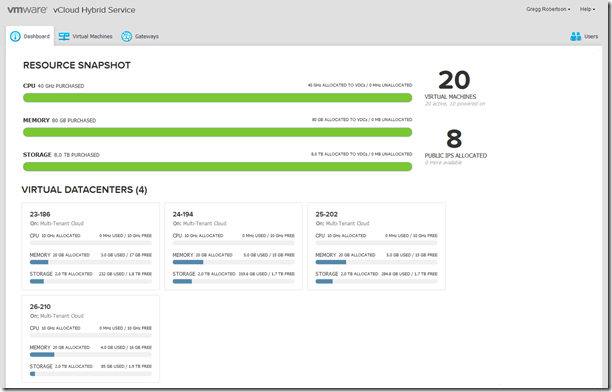 You can easily review how much of your total resource is utilized and if you have more than one virtual datacenter you’ll observe the same utilization report per instance. The virtual datacenter that I shared among three other people was number 25-202. If you click on the virtual datacenter in the Virtual Datacenters section above then it will take you through to your virtual datacenter page where you can check on your Usage & Allocation, Virtual Machines, Gateways, Networks and the Users who have access to this Virtual Datacenter. I created a number of virtual machines for a test I am planning to blog about around using vCenter Configuration Manager in vCHS. One of these virtual machines is an MS SQL server which you can see below. You can access your virtual machines from either the virtual machines tab at the top of the page or via the Virtual Datacenter tab shown previously. 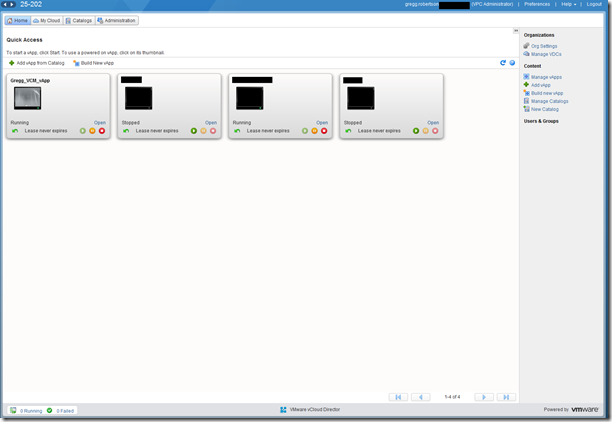 If you are a user with permissions to access the vCHS vCloud Director portal (VPC Administrator) you’re able to manage VMs that you have permissions to using vCloud Director by simply clicking Manage VM in vCloud Director (shown below). Personally I prefer working in the vCloud Director portal as this is something I’m very familiar with but the vCHS portal is more than adequate to undertake administration, it’s not too dissimilar to the standard vCloud one with an organization administrator view. The flagship feature of the vCHS hybrid cloud connectivity is the ability to migrate workloads using VMware’s vCloud Connector using the new Data Center Extension in vCC 2.5 between your private vCloud instance and vCHS. I’m still testing this functionality but what I’ve seen so far the stretch deploy feature is looking like an amazing use case for people looking to migrate high workload resources to vCHS Chris Colotti covered a real world case and how he utilised stretch deploy here and here. My initial impression of this service is really good and I’m looking forward to getting even more stuck in with real world customers and requirements. I’ll hopefully have my VCM blog posting out very soon although with all the goodness coming out of VMworld US it’s going to be hard. Categories: vCloud, Virtualisation, VMware | Tags: Data Center Extension, DCE, Stretch deploy, vCHS, vCloud Director, vCloud Hybrid Service, Virtualisation, virtualization, VMware | Permalink. 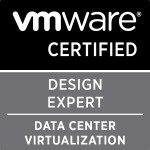 This morning I sat the VCP5-IaaS exam and am very pleased to say I passed it and with a pretty good score too! I decided to do the exam as I have been busy with a number of vCloud engagements and had a spare few days to prepare and get it done whilst the ability to gain the VCP5-Cloud if you have the VCP5-DCV was still available. – The Trainsignal VMware vCloud Director Essentials videos by David Davis. I used these videos quite a while ago when they first came out which helped me gain a very good base knowledge and used a few of the videos again as the VCP5-IaaS exam is based on vCloud 1.5 and I have been using vCloud 5.1 most recently so needed to try remember/block out a few things. – I also used the Trainsignal VMware vCloud Director Organizations set of training videos done by Jake Robinson. These are also based on vCloud 1.5 but give a great view of how an organisation administrator would do tasks. – I used a third set of Trainsignal videos for my preparations were the VMware vCloud Director 5.1 Essentials set of videos by VCDX #104 Chris Wahl. These are for vCloud 5.1 whereas the test is vCloud 1.5 but the videos were brilliant and Chris explains vCloud networking amazingly which is the hardest part to get your head around in vCloud. – For the above three sets of videos I followed along whilst doing it all in my lab and would HIGHLY recommend doing it this way as I don’t think you can understand vCloud without actually doing it yourself. – Paul McSharry created three practice test for the VCP5-Iaas which can be done here VCP5-IAAS Practice Test 1, Test 2 and Test 3. These were great as a last minute practice test late yesterday to make sure I wasn’t missing anything. – VMware vCenter Chargeback Manager is a big portion of the exam and I used the VMware vCenter Chargeback Fundamentals course to get my knowledge up to speed on the product. This course is really good and massively important as if you haven’t used Chargeback before you will be lacking in the exam. – Lastly I used the vCloud Architecture Toolkit (vCAT) pdf’s which I read through and made sure I understood it all. This was probably a bit of overkill as the VCP5-IaaS exam is the entry level exam whereas the vCAT is geared more towards the CIA and CID but it gave me a great holistic view of how everything worked so if you have the time I would recommend reading them or at some of them. Due to my last two exams being the VCAP5-DCA and VCAP5-DCD I was used to having to burn through the exam/questions so having to go through the 85 questions was quite refreshing and the exhibits and questions were also fairly straight forward. I finished quicker than I thought I would which I put down to being used to the VCAP exams pace and felt the questions were easier than the ones for example were in the VCP5 (DCV). Good luck to anyone looking to do the exam. I felt it was really fair although I may still be in a VCAP mind-set and is much shorter than the VCP5-Cloud so if you have your VCP5 already then I would say go for this whilst the “upgrade” path is still available. For me I think I am done for quite a while now and will be focusing on slowly building my VCDX design for a future submission. Categories: Certifications, vBrownbag, Virtualisation | Tags: Chargeback, vCloud Director, VCP5-Cloud, VCP5-IaaS | Permalink.